Local businesses Every Penny Counts Canister Meals on Wheels Solano County can host a Meals on Wheels canister in their business for collection of donations. The “Every Dollar Counts” canister program is a great way to show your clientele that you support local non-profits and provides a source of revenue to help us support our programs. Hosting a canister entails no extra work on the part of the host. A Meals on Wheels staff or board member will bring you a canister and arrange for pick-up and replacement canisters for you. Your business’s name will be listed on our website as a supporter and an “Every Dollar Counts” Canister Host. If your business would like to host an “Every Dollar Counts” canister please call 707-425-0638 or click here to send us a message. Philanthropy starts at home. 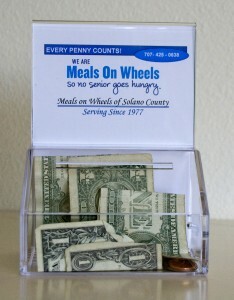 Solano County is home to Meals on Wheels and we serve over 650 meals a day to seniors in need within our community. Considering a corporate sponsorship is a wonderful way for businesses to give back to the communities they serve. We provide services to Benicia, Dixon, Fairfield, Rio Vista, Vacaville, Vallejo and all unincorporated areas of Solano County. Corporate Sponsorship entitles your logo to be prominently featured on our website and all printed and electronic marketing materials. Your name and logo will be listed on all marketing material and on our website. Your name and logo will be posted on our website as a sponsor. Funds are guaranteed to remain in Solano County with 100% being used for direct program support.